The following is the list of Nominees presented by the 2017 Nominating Committee. 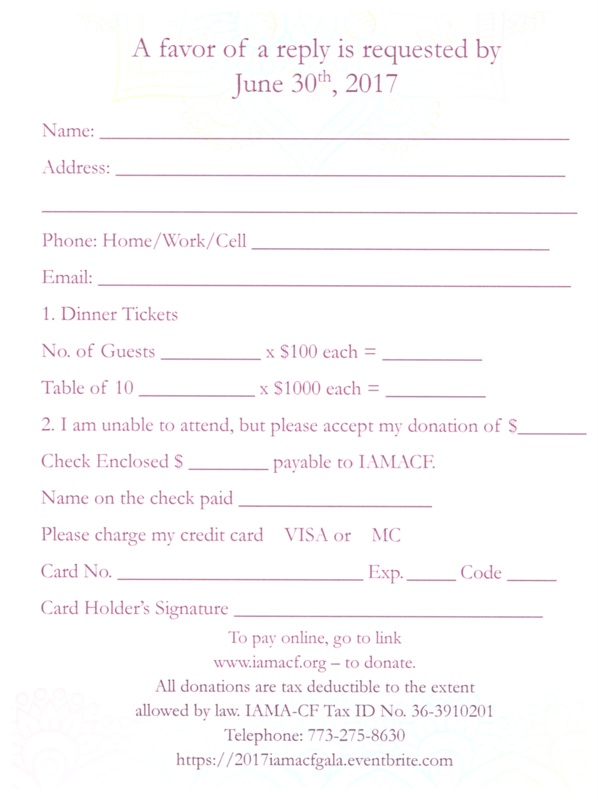 If there are any additions please communicate them via email to office.iamaill@gmail.com no later than Monday, October 30, 2017. The Official Slate of Candidates will be Announced on Wednesday, November 1, 2017. 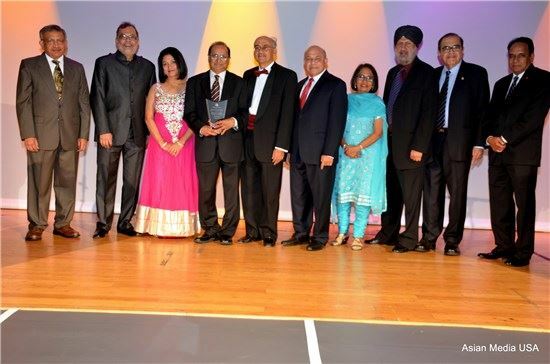 Indian American Medical Association – Illinois in collaboration with the Chicago Medical Society's Project SMILE (Saving More Illinois Lives through Education) provided a Hands-Only CPR Informational Program to U.S. 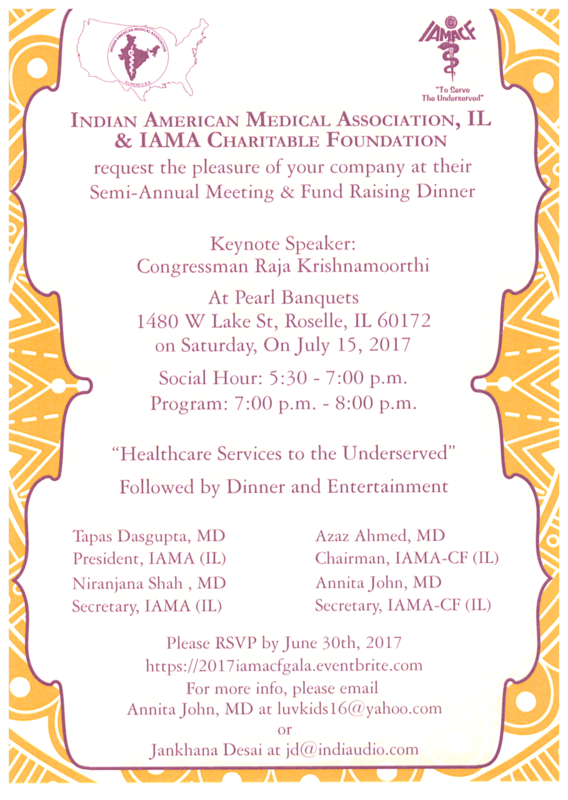 Congressman Raja Krishnamoorthi and his Staff, on Thursday, July 6, 2017, in Schaumburg, Illinois. U.S. 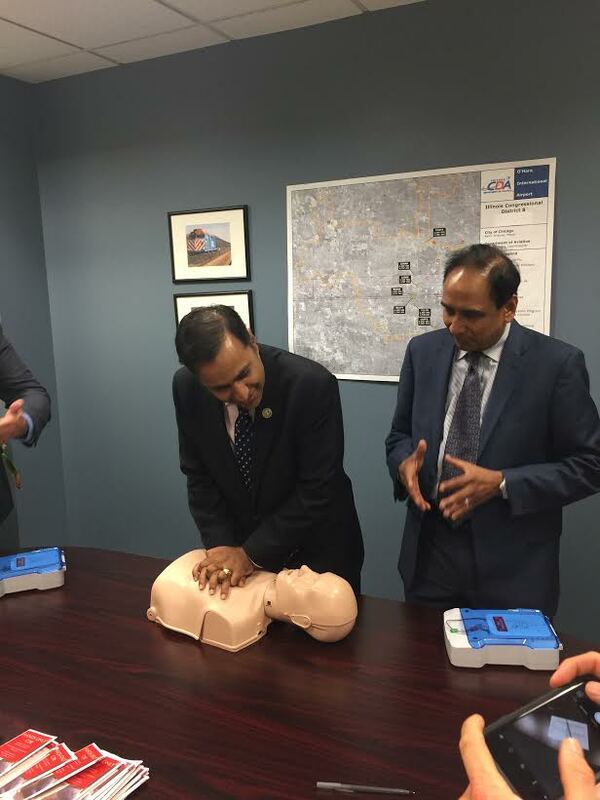 Congressman Raja Krishnamoorthi practicing Hands-Only CPR with instruction from Dr. Vemuri Murthy. 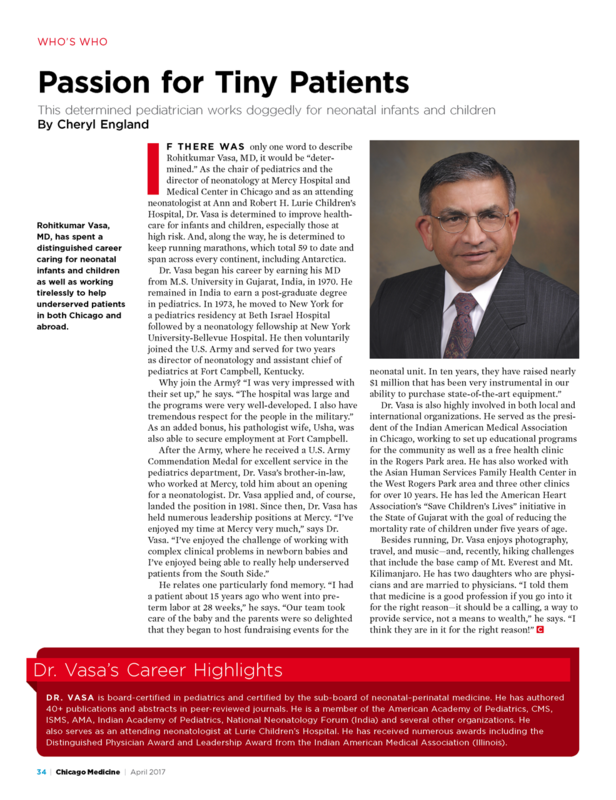 Pictures (left-right) Dr. Sreenivas Reddy, President-Elect IAMA-IL; Dr. Vemuri Murthy, President-Elect Chicago Medical Society and Past-President, IAMA-IL; U.S. 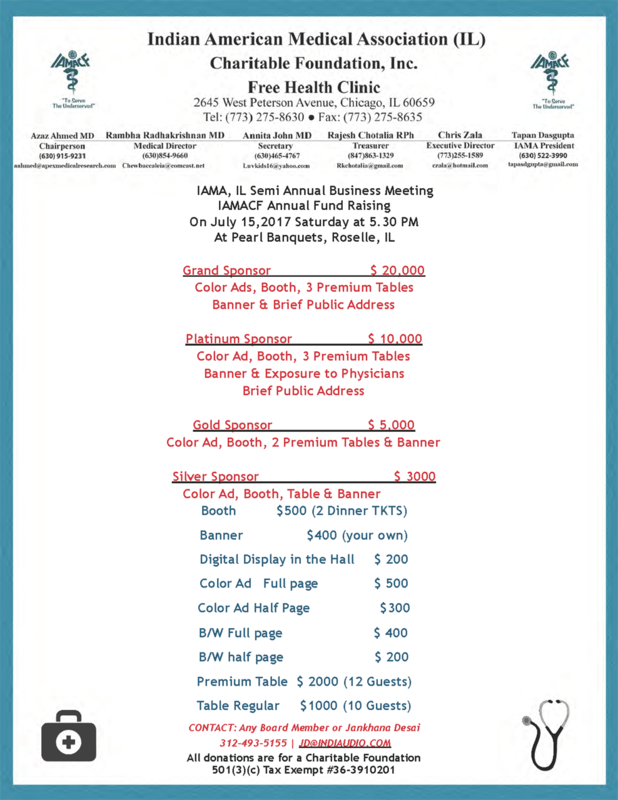 Congressman Raja Krishnamoorthi; Dr. Suneela Hasroor, Chair Health Awareness Committee IAMA-IL; Theodore Kanellakes, Executive Director Chicago Medical Society. 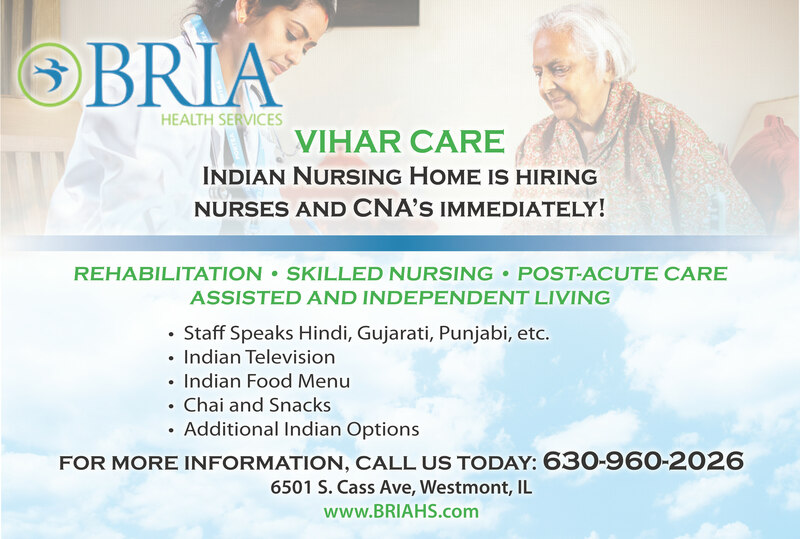 BRIA Health Services of Westmont is pleased to announce our new project – VIHAR CARE, an Indian Nursing Home! 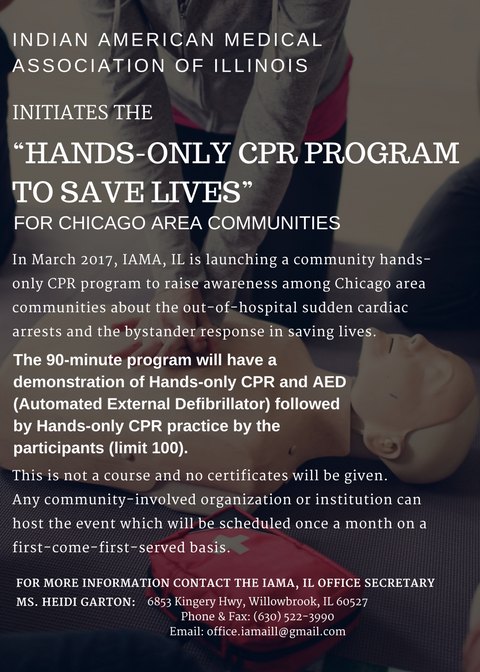 IAMA-IL initiates "Hands-Only CPR Program" to save lives in Chicago area communities. 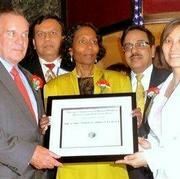 Mayor Richard Daley and Chicago Commission on Human Relations awarded IAMA CF Free Health Clinic for Commitment and contribution in the field of Health care that has made a substantial positive influence on the lives and livelihood of all Chicagoan's" Congratulations to IAMA CF!